Delmarva RV Center is pleased to carry the Keystone RV. Founded in 1996, the Keystone Company is the number one manufacturer of fifth wheel recreational vehicles and also produces high quality Travel Trailers, Lightweight Travel Trailers, Toy Haulers, and Destination Trailers. As one of the largest manufacturers of Towable RVs, Keystone RVs offer high quality amenities and luxuries for an affordable price. 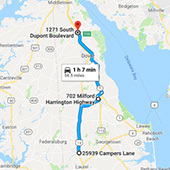 At Delmarva, we offer a huge inventory of keystone fifth wheels, toy haulers and travel trailers at our Seaford, Milford and Smyrna, Delaware locations. Take a look below and give us a call or fill out our contact form for more information!